Origin and Habitat: Aloe branddraaiensis is endemic to the Northern Province and Mpumalanga, Republic of South Africa. It has a very restricted range (Extent of occurrence about 800 km²), but is quite common in that area and north to the Olifants River. Particularly common in road verges along the Abel Erasmus Pass. Habitat and Ecology: This species grows in bush-veld (Savanna) on very thin soil close to the escarpment, at high altitude. It is often found on disturbed sites and is not suspected to be declining or threatened with extinction. 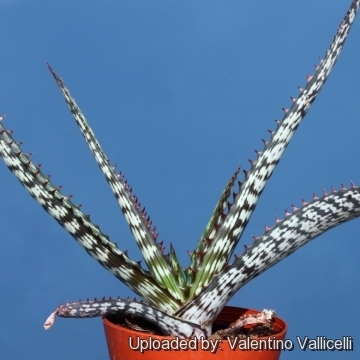 Description: Aloe branddraaiensis is one of the best stemless linearly striped aloes very nice pattern upon the leaves. It rarely exceed 30 cm in height excluding inflorescences, often suckering it form small clumps. In shady areas the leaves don't colour much, but when under stress the greenish leaves takes beautiful reddish-brown tinge. The tips of the leaves tend to dry out and die back and can sometimes be twisted. The blooms are very decorative, globoid in shape and reddish orange with a hint of green. The much-branched inflorescence distinguishes this species from all other maculates. 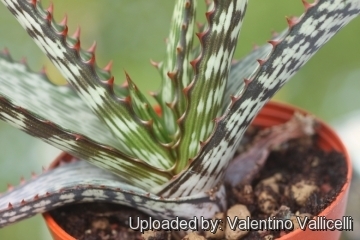 Derivation of specific name: Aloe branddraaiensis is so named because it was first collected at Branddraai in the Mpumalanga Province of the Republic of South Africa. Stem: Almost stem-less or very short, usually simple, but may form small clumps from suckers. Rosettes: With 20-25 leaves, rosulate, subdistichous or spirally twisted, always arranged in two vertical rows on opposite sides of the stem in young specimens and almost horizontal. Leaves: 250-500 long, 60-100 mm wide, green, greyish or brownish, lineate, with many H-shaped spots irregularly scattered. 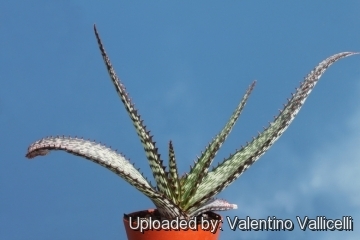 In full sun the leaves of Aloe branddraaiensis are short, and in the shade or in the garden the leaves are much longer. In a dry season the tips of the leaves of these aloe plants dry out and curl. Inflorescences. Developing from coral red buds with striped green ends, 1-1,5 metres in height. The inflorescences is one of the most branched of all the Aloes with 40 to 80 capitate racemes (forming dense headlike clusters at the tip) on a single stalk. Each heads about 3-6 by 7 cm with about 15 flowers. Bracts triangular about 8 mm long 8-12 mm long, 2.5-4.0 mm wide, 3-5-nerved. Pedicels 15-20 mm long and shorter on lateral racemes, lengthening to about 25 mm in fruit. Flowers: Dull scarlet dull scarlet-red with paler longitudinal stripes at base, subclavate to clavate above basal constriction, paler at mouth, 15-27 mm long, base rounded, 5,5 mm in diameter. Ovary narrowed to 3,5 mm above, then enlarging to 6 mm at mouth; Tepals free for 7 mm, inner segments adnate to outer. Stamens not or hardly exserted 1 mm. Blooming season: Winter (June to July). Fruits: Pale greyish-green, about 16 by 8 mm broad. 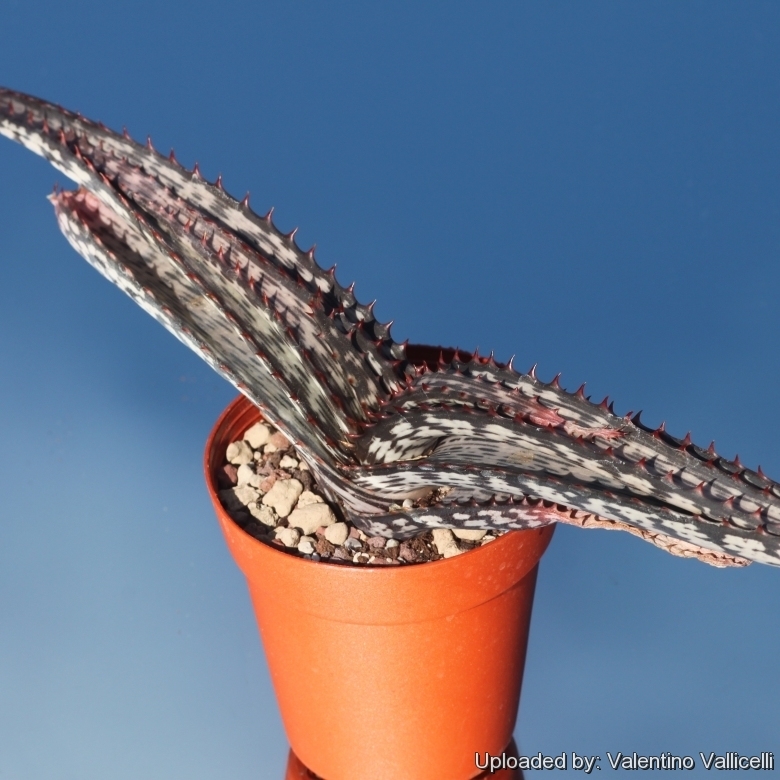 Similar species: When not flowering, A. branddraaiensis may be distinguished from the geographically close Aloe fosteri by the disposition of the leaves, which are almost horizontal in this species but ascending to incurved in that one. 11) Van Wyk, B.-E. and Smith, G. “Guide to the aloes of South Africa.” Briza Publications, Pretoria. 1996. 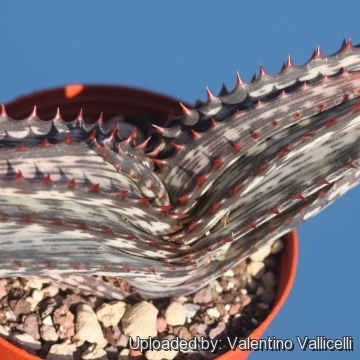 Cultivation and Propagation: Aloe branddraaiensis is one of the more attractive stemless linearly striped aloes easy to grow and adaptable, it suckers and can form dense groups. It can be grown in large containers. Soil: Always use a good quality, loamy sandy soil with plenty of drainage with chips at the bottom of containers. Watering: Needs moderate to copious waterings in summer, but do not overwater, or not at all in the colder months of winter. Outdoors it can withstand long periods of drought, but they will thrive and flower more profusely if watered in the correct season. 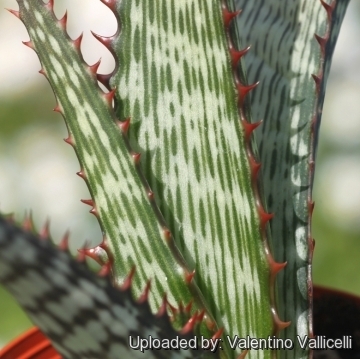 This aloe is very tolerant of drought, although the tips of the leaves may wither and curl during hot, dry periods. Supplemental watering will help keeping the leaves plump and juicy. Exposure: It need full sun to partial shade, but plants grown in partial shade usually look healthier and more succulent. It is however very hardy when grown in full sun with the minimum water. Pests & diseases: Incorrect watering, poor drainage or too much shade can lead to attack by pests and diseases. Maintenance: Removal of old flower stalks; Divide the crowded clumps periodically. It grows much better outdoors in spring and summer. Gardening: In mild climates it can be cultivated outdoors for use in landscaping, it can be grown in large, rocky, well-drained soil in gardens in drier areas. It adapts well to a variety of soils and climates, but will grow best in regions with a climate close to that of its native deserts not too cold, and not too wet. It makes an excellent ground cover, grows best in a sunny position and makes a long lasting cut flower. They grow slowly, but not agonizingly so being able to increase their width by 10- 20 cm per year under favourable conditions. Propagation: By division of offshoots that develop around the outside of the main rosette in spring, the cuttings must be dried out for at least 1 week before planting in river sand. It is easily rooted in potting soil with warmth. It can also be propagated or by seed planted in autumn, in trays of coarse river sand, compost and soil. Sprinkle the seeds evenly on the surface and cover with a layer of small pebbles. The pebbles help the seedlings to stay upright and prevent damping off. Fresh seeds germinate quickly at 18° C. Keep seed tray in a dry corner and do not allow to dry out, but may damp off if overwatered. Transplant the seedlings after one year.